It’s an exciting time of year when a gentle thud on your doormat marks the arrival of the first season’s greetings; and with many more to follow over the festive season, it seems like the perfect time to remind you to save your used postage stamps! 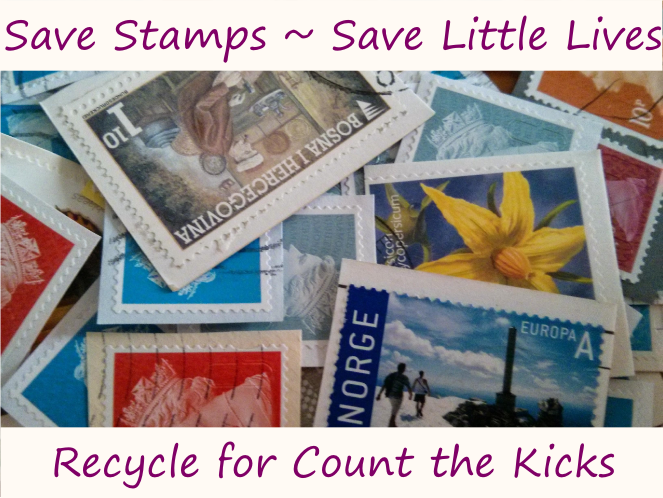 Lots of charities raise money through stamp collecting, but I save mine up for Count the Kicks, a wonderful charity set up in 2009 to educate mums on the importance of monitoring baby’s movements. Count the Kicks produce leaflets with information on fetal movement aimed at giving mums the confidence and knowledge to trust their instincts if they feel something is wrong. They also produce stickers for maternity notes encouraging mums to contact their midwives if they are worried. It only takes a few seconds to cut the used stamp off your envelope before you toss it into the recycling bin, so please please spare the time, if you can. If you don’t already do this for another charity, please consider doing it for Count the Kicks. Together we can help #SaveLittleLives. P.S. There are many other things you can recycle in support of Count the Kicks, including baby food pouches and biscuit wrappers; find out more and locate your nearest local collector.